Some of the best wakeboard towers have the potential to drastically improve your boating and wakeboarding experience. One of the main advantages to installing a good wakeboard tower to your boat is that it offers the rider greater hang time. In the not-so-distant past, we were confined to extended pylons which were unstable and constantly needed adjusted. *Swipe to see all products on mobile. Star ratings based on the view of the editor. Although high quality wakeboard towers are more expensive, they offer greater stability, look better, and will last much longer than pylons. Aside from simply improving your performance, wakeboard towers come with other desirable benefits. If you accessorize them to their full potential, they can be used as wakeboard/impact vest storage, you can hang wake tower speakers, and you can kit them out with lights. Before taking the plunge, there are certain considerations to ponder. You can choose from a few different styles and models, each with their own benefits. For example, foldable towers can be removed easily for boat storage, but are more expensive and generally less sturdy. Fixed towers tend to be cheaper, but the main downside is that you’d have to remove the whole thing if you don’t want it on. We’ll go more in-depth about these kind of considerations later on in this guide. For now, we’ll jump into the reviews of some of the top wakeboard towers you can get your hands on. We’ve tried to include a variety of products since there isn’t a one-size-fits-all method to choosing a tower. Which is better: collapsible or fixed? Can You Install the Tower? This quiet universal wakeboard tower is one of the most popular ones from Aerial and is set to make a great improvement to virtually any boat. The elegant black design is subtle enough that it will coordinate well with most boats. The boat tower has been constructed to fit beam widths between 76 and 108 inches. Additionally, the collapsible design makes transportation far easier and is useful if you need to store your boat under a roof with a low ceiling. 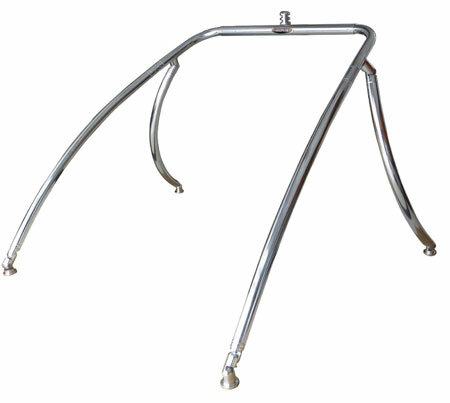 The tubing is 2.25 inches in diameter and has been made with a high quality, polished aluminum. Not only does this look nice but it is also built to last beyond its 5-year warranty. 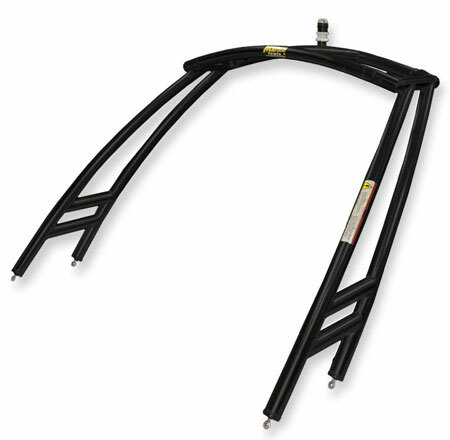 The lengthy warranty on the product is a vote of confidence by Aerial in their tower’s durability. It may take a couple of you to install the tower but it has been designed to be relatively easy and should only take you around 3 or 4 hours to do so. We have another universal boat tower here, this time from Monster Tower, a well-established and favored brand. Similar to Aerial’s Airborne tower, this one fits boats longer than 16 feet and between 72 and 102 inches wide, making it relatively versatile. The tower sports a forward-facing design which helps to give you boat a sleek and aggressive look. Furthermore, it is available in either black powder-coated or polished and anodized (chrome look). 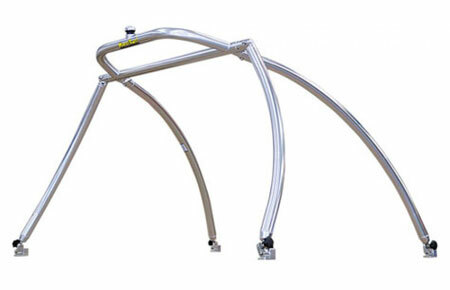 The sturdy tubing is 2.5 inches in diameter, made from an aluminum pipe construction which is designed to be durable and resistant to corrosion. If you need it to collapse, the process is fairly simple and it can either be folded forward or backward, depending on your available space. Coming with a five-year warranty, there is plenty of space for kitting your tower out with accessories like lights, speakers, and wakeboard racks. This is one of the more expensive towers from Monster Tower’s range and it is reflected in the quality of the build and beautiful design. Significantly lower in price ($599 at the time of writing this), the MT1 is the OG of Monster Tower universal wakeboard towers. It actually rocks a fairly similar look to the MTK tower, with only a few differences. The most significant difference in design is that this tower faces backwards rather than forward. The tower also fits a wider range of boat sizes, between 60 and 102 inches which makes it better suited to smaller boats than the previous two towers we have reviewed. Similarly, though, the 2.5-inch diameter tubing is constructed from a strong aluminum. Again, you have the option to choose from either a black-powdered finish or a polished finish which gives it a chrome look. If your boat has curved surfaces, this tower is your friend because it comes with ‘Monster Paws’ which allow you to easily install it. 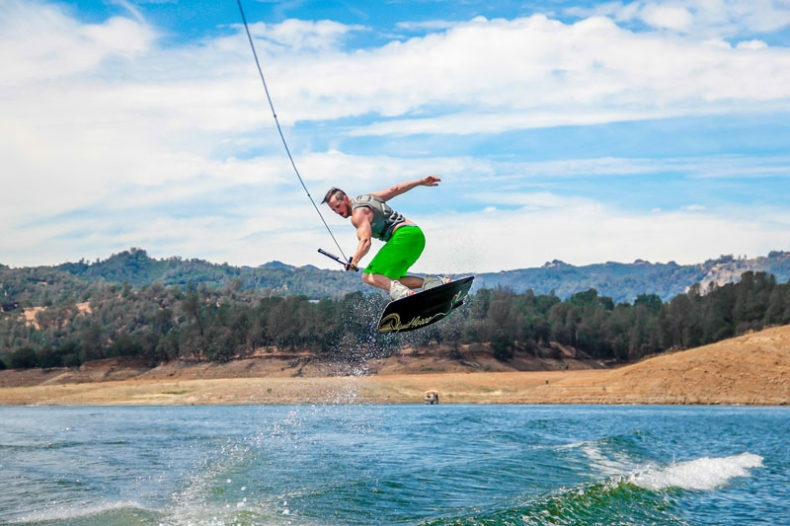 One common complaint with wakeboard towers is noise, creeks, and squeaks. Boldly, Monster Tower state that this tower is completely silent, which will come to the delight of many a boater. Finally, quick releases on the tower make the folding process a breeze and you require absolutely no tools to take it down. This makes storing your boat pain free. Further down the price bracket ($499 at the time of writing), we’ve got the Origin OWT-I wakeboard tower. This simplistic universal design fits 68-98-inch wide boat beams which is a slightly smaller range than the previous towers we’ve looked at in this guide. Although the price is lower, we’re not concerned about the durability of this tower. This is especially true given that it comes with the standard 5-year warranty which you can expect from decent wakeboard towers. The aluminum tubing is ever so slightly smaller, coming in at 2.25 inches. Another positive about this tower is that it was designed so that you can easily keep it in places with low storage. The back legs are easily detached from the deck mounts and swing back. The front legs then pivot in order to lower the height. The installation process is easy and should only take a couple of hours with somebody to help you. All of the mounting brackets and hardware that you’ll need is included. If you haven’t chosen a wakeboard tower before, there’s a lot to consider. Fortunately, it doesn’t need to be confusing and we’ve done our best to keep this guide as simple as possible, yet covering most of the important aspects to choosing a tower. If you’re buying a brand new boat, then this consideration won’t even be on your radar. Almost all new boats will come with the option of an ‘original equipment manufacturer’ tower (OEM). If it’s not a new boat you’ve got or you’re simply buying one without this option, then you’ll have to opt for an after market tower. This is where you have to make a few more careful choices about what sort of tower to choose. 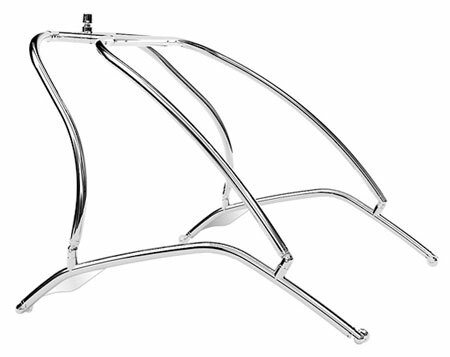 If you’re lucky, you’ll be able to get one which has been specifically designed for your boat’s shape and size. If this is the case, it’s one of the easiest ways to go because you know that it will fit very well and won’t need adjusted. The remaining options are either universal towers or custom-built ones. Understandably, custom-built wakeboard towers will be more expensive, but will be built to your exact specifications i.e. dimensions, color, and material. Universal wakeboard towers are great because they are more cost-effective but you need to take a lot more care in installing them to make sure they fit properly. Another downside to universal/adjustable towers is that you’ll not always get it in the color or material you want. The answer to this is subjective, meaning that it is based primarily on your needs and wants. There are pros and cons to each, but your decision making will almost solely be based on how you intend to use your boat and tower. Collapsible towers are super useful for those who store boats in a garage or a place with a low roof. They’re generally pretty easy to collapse however, they’re often more expensive than fixed towers and less sturdy. Some towers will either collapse all the way or only to windshield level so, before you buy, make sure that it will fold to the height you need. A rigid, or fixed tower, is very sturdy and cheaper than collapsible ones. However, unless you’re storing it somewhere with big head space, then you could struggle to fit your boat. This will mean that you’ll have to completely remove your tower, which is a bit of a pain. Understandably, people like their boats to look nice. If this is you, then color can be another factor to consider before you buy. Black is a safe play and it can suit itself to many other boat colors. It’s also a fairly standard color for wakeboard towers to come in. Although almost all towers provide roughly the same function, the shape and size can vary greatly. It’s just personal preference and there isn’t really one which is better than the other in terms of functionality (although we’re sure manufacturers may try to hint at this!). Some dealers actually provide the option for them to install it for you. This is really handy if you have no clue what you’re doing because it can be a fiddly process. Of course, it will come with instructions on how to do it yourself, but the risk is that you damage your boat in the process and it’s your fault, not theirs. Unless you’re super confident that you know what you’re doing, we’d always recommend getting a professional to install it for you. It’ll cost you a small fee, but it’s a much safer and hassle-free option. · Do you need it to collapse or happy with it rigid? · Who’s going to install the tower? Like we mentioned at the start, if you’re only using a wakeboard tower for improved wakeboarding performance, then you’re not doing it right. All of these accessories (on their own or combined) will make a huge impact to your boating experience. We don’t consider them fancy and unnecessary, either. They’re hugely practical, freeing up floor space, keeping your gear from getting damaged, and adding storage space. The only downside we can see is that you can end up spending a lot of $ and still want more!